Everybody loves a great apple pie, but this apple cake is not only unique, it's delicious! 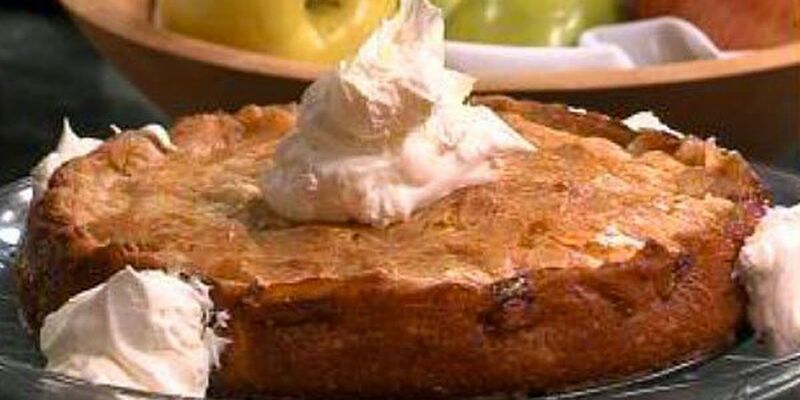 For a truly French flair, top each slice with a dollop of crème fraîche or Calvados-laced whipped cream. Adjust oven rack to lower-middle position and preheat oven to 325°F. Spray a 9-inch springform pan with vegetable cooking spray. Place prepared pan on a rimmed baking sheet lined with aluminum foil and set aside. In a large sauté pan, melt butter over medium-high heat. Sauté apple slices 2–3 minutes or until softened. Add cinnamon and stir to coat. NOTE: You may wish to microwave apples instead of sautéing for 3 minutes or until apples are slightly translucent and pliable. In a large mixing bowl, toss apple slices with Calvados and lemon juice then let cool 15 minutes. In a large mixing bowl, whisk together 1 cup flour, 1 cup granulated sugar, baking powder and salt. In a separate bowl, whisk together 1 whole egg, oil, milk and vanilla until smooth. Add dry ingredients to wet ingredients and whisk until just combined. Transfer 1 cup batter to a separate bowl and set aside. Add egg yolks and applesauce to remaining batter and whisk until just combined. Fold in cooled apple slices. Pour batter into prepared pan and spread evenly to pan edges, gently pressing on apples to create an even, compact and smooth surface. Whisk remaining 2 tablespoons flour into reserved batter. Pour mixture over apple batter and spread to pan edges then smooth surface. Sprinkle remaining 1 tablespoon granulated sugar evenly over cake. Bake 1¼ hours or until center of cake is set, toothpick inserted in center comes out clean and top is golden brown. Transfer pan to wire rack and let cool 5 minutes. Run a paring knife around the sides of pan and let cake cool completely, 2–3 hours. Dust top lightly with powdered sugar, cut into wedges and enjoy.